Logan Foust, age 15, first got into the Hydroflight sport in early 2012. At the age of 11. When the first boards hit the market Logan saw the video on YouTube and knew it was something he wanted. Logan has been on the water ever since he can remember. 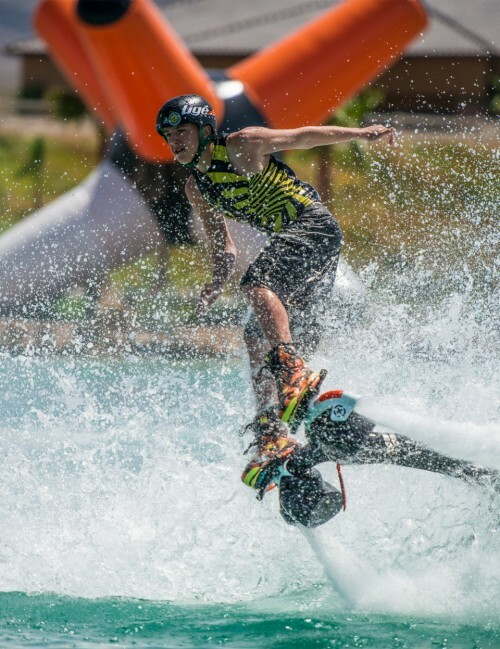 Logan spent hours and hours every weekend, trying to master wake boarding prior to first seeing the hydro board. Since then Logan has went from averaging 100 plus hours in a 3 to 4 month period behind a boat to about the same or more hours standing on a hydro board. Hydroflight has consumed most all of his time spent on the water theses days. Logan made his first competition at the NAFBC in 2015. At the time Logan did not know what to expect nor had any formal training. He qualified in the rear of the pack so he was near the first to be in the water. Even still he managed to get a ranking of 24th. Looking back and seeing after the fact, had he known he could have put in a few more tricks and brought his ranking up! All said and done, before Hydro Fest in Vegas, he was ranked overall at 50th on the world. Since the earlier days Logan has practiced and pushed his boundaries and been able to gain leaps and bounds in his flying ability and knows he is still only scratching the surface of where he wants to be. In addition for his extreme love of water, Logan also has a love of flight in planes. The inception of a hydro flight device, combined his two biggest passions, being in the air and on the water at the same time. It just doesn’t get any better. Several years before hydro sport became a reality, Logan would mention how it would be the ultimate for the sport to take off, to be able to start on the ground floor and one day get noticed and sponsored. While he thought that was a far off dream, it turned out not to be so far off or so such a dream. Logan is beyond excited and grateful for the opportunity to be sponsored by X-Jets and to be a part of the Rebel Faction family. And plans to bring positive attention to the sport and brand.